In 1872, one of America's leading weekly independent newspapers was founded in the city of Newark--the Newark Sunday Call. It was the same year that James Gordon Bennett, one of the leading journalists in American history died. As James Gordon Bennett had introduced many landmark innovations in American journalism, so, too, the new Newark Sunday Call would go on to create its own history in the nearly three quarters of a century of its life. The life of the Newark Sunday Call ended on November 17, 1946 when it suspended publication with a boxed announcement atop page one of its final issue, written by Frederick W. Thorne, who had been the Call's publisher since 1940. Concurrent with the announcement of the suspension of publication by the Sunday Call came an announcement from the six-day-a-week Newark Evening News that it would begin a Newark Sunday News edition starting on November 24th. The reason for the suspension of publication, according to the Call's publisher, was that revenues from a single weekly issue were insufficient "to maintain a modern Sunday newspaper, whose readers demand a bulky armful of entertainment and information." The final edition of the Newark Sunday Call on November 17, 1946, sold over 400,000 copies. The selling price was 12 cents. The first edition of the Newark Sunday News, which followed on Sunday, November 24th, too, was over 400,000. The transition form The Newark Sunday Call to The Newark Sunday News was seamless1. Its price was also 12 cents. 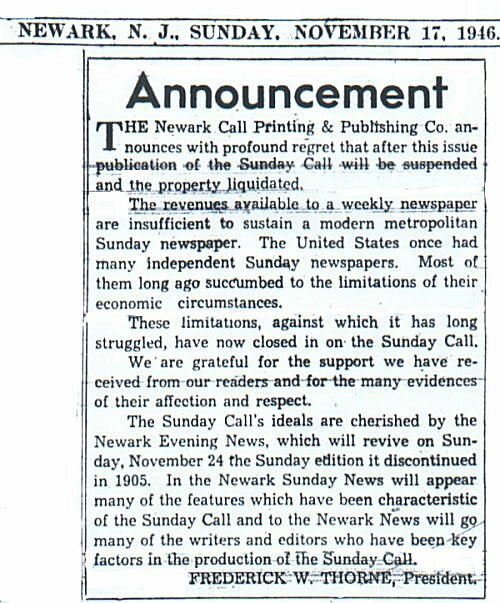 In the upper left-hand corner of the Editorial Page of the final issue of the Sunday Call was a six paragraph announcement that opened with "This is the last issue of the Newark Sunday Call." The announcement appeared under a boldfaced heading "The Sunday Call Suspends." The suspension announcement stated that the Sunday Call had been respected by New Jersey readers because it reported the news honestly, and commented on it fairly and courageously. It stated further "The same ideals are cherished by the Newark Evening News which, on November 24th, will revive the Sunday edition it discontinued in 1905." 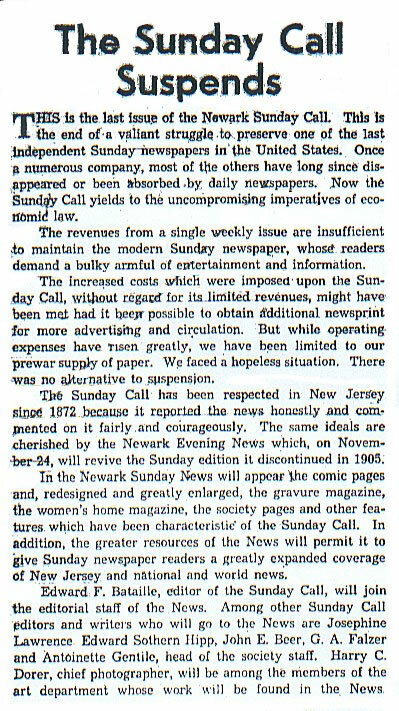 At the time of its demise, the Sunday Call editorial approach was unlike the two Newark dailies--the Newark Evening News and the Newark Star-Ledger. The Newark News had been likened to the staid New York Times and had a largely upscale circulation as it endeavored to be a truly state paper with bureaus or representatives throughout the state. The Star-Ledger in that era had more of a blue-collar appeal and had emerged from a seven-day-a-week sensationalist tabloid format in the early 1930s when it competed with the two New York City tabloids. It became a full-sized paper in 1939 when the Ledger bought the Star Eagle. What made the Sunday Call different from both Newark dailies was that being a once a week paper, it could do its journalistic job more leisurely, in greater depth, and with more completeness. Where a daily might run a story that was incomplete, it could continue with follow-up daily stories. But not so with the Sunday Call. It had one shot at a story and tried to make it as complete as possible, with quality reporting. Having an entire week, the Sunday Call also had more feature stories, longer news stories, and more pictures. Its quality reportage was on a par with the Newark News. Sunday Call stories took a more leisurely approach and focused more on life and living and on community concerns than on fast-breaking news happenings of the day. Although the Call had over 400,000 circulation, it had been unable to obtain more newsprint for future growth in either circulation of advertising, and with ever-mounting expenses, finally decided to give up. In its first year, 1872 -- the year before the world's first typewriter came off the Remington assembly line -- the Sunday Call circulation had reached only eleven hundred copies. Through three generations, ending in 1940, the Sunday Call was served in various capacities by members of the Hunt family. The first Hunt affiliated with the Call was Dr. Sanford B. Hunt in 1872, the year the Call was founded by Frank F. Patterson. William Talmadge Hunt acquired an interest in the Sunday Call in 1885 and served as editor-in-chief from 1885 until 1916. William T. Hunt's son, William S. Hunt, joined the Sunday Call staff in 1903 and in 1917 became its managing editor. On the death of G. Wismer Thorne in 1935, William S. Hunt succeeded G. Wismer Thorne as president and publisher of the Sunday Call and held that post until he died in 19402. On William S. Hunt's death in 1940, he was succeeded as president and publisher by Frederick W. Thorne who in November 1946 drafted the announcement of the Call's suspension of publication. In 1921, the first year of commercial radio broadcasting, The Sunday Call made radio history by broadcasting a World Series baseball game, the first such broadcast ever, from New York's Polo Grounds. The Sunday Call sent a reporter to the Polo Grounds and there he put the ongoing game, play by play, on a telegraph line to the Sunday Call office. There the plays were handed to the Sunday Call sports editor, Gus Falzer, who read them into a telephone line to the newly-established broadcasting station of the Westinghouse Company at the corner of Plane and Orange Streets. From there, the phone call was broadcast over the air. Station WJZ was America's second licensed broadcasting station. In October 1921, the first month of Newark-area radio broadcasting, children listening to radio station WJZ in Newark were told "The radiophone, which is the wireless, has made it possible for the Man in the Moon to talk to you" as the station began evening readings by Sunday Call reporter Bill McNeary of short stories written by Sunday Call staffer Josephine Lawrence. In 1922, a collection of these "Man in the Moon Stories Told Over the Radio-Phone was published in book form. Sylvester Southworth was the maternal great-grandfather of William S. Hunt, Sunday Call publisher from 1935 until his death in 1940. Southworth had joined the Sunday Call staff in 1903 after previously working at James Gordon Bennett's New York Herald, a landmark paper in the history of American journalism. While Southworth had worked at the New York Herald, that paper had introduced many newspaper publishing innovations which would later guide Southworth at the Sunday Call. Among them was use of the telegraph extensively in newspaper reportage, pictures to illustrate news stories, financial news of Wall Street, and war and foreign correspondents. Edwar Stratemeyer was a Newark native that had written for the Newark Sunday Call. By the time of his death on May 10, 1930, he was hailed as father of a great literary empire that spanned 75 years, and that produced such best-selling series as The Rover Boys, which Stratemeyer created and wrote; also the creation of such series through his publishing organization (The Stratemeyer Syndicate) of Tom Swift, Nance Drew, The Hardy Boys, and The Bobsy Twins. Stratemeyer wrote The Rover Boys under the pen name of Arthur W. Winfield. More than six million copies were sold of the original published editions. Josephine Lawrence, who had started with the Sunday Call as editor of the Call children's page in the 1930s and later went to the Newark News from the Call, went on to become a leading writer of children's books and, later, numerous adult novels. In her heyday as a book author, she had been linked in popularity with such writers as Somerset Maugham and John Steinbeck. In a 1940 Chicago Tribune Books Supplement, the editor called Josephine Lawrence "The chronicler of the commonplace, the recorder of the ordinary and the mirror of the common people." Her juvenile fiction was also published in book form by the Stratemeyer Syndicate which was headed by her former Sunday Call colleague, Edward Stratemeyer. Robert Parker, whose career started as a staffer at the Sunday Call, had been a foreign correspondent, a former director of the Associated Press in Eastern Europe in pre-World War II, and during World War II had served as Chief of the Office of War Information for Eastern Europe. He had joined the Sunday Call staff after graduating from Union College in Schenectady, and later wrote for the New York Journal before transferring to The Associate Press.